As viewers of the brilliant documentary Helvetica know, typographic design choices can have a powerful influence on our perceptions, and even our emotions. 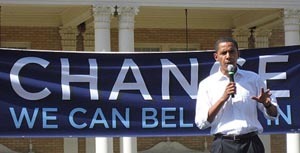 Barack Obama's campaign knows this, as evidenced in the thought they put into the design of the large "Change We Can Believe In" signs at Obama rallies. Those signs are written in a font called Gotham, designed by Jonathan Hoefler and Tobias Frere-Jones for GQ Magazine (look at the cover of GQ, and you'll recognize it right away). The DVD version of Helvetica has an interview with Hoefler and Frere-Jones where they talk about some of the design decisions that went into the creation of Gotham. In their words, "GQ had a dual agenda of wanting something that would look very fresh, yet very established, to have a credible voice to it." There's a video excerpt of the interview on the Helvetica website.